AQUA KITTY UDX blasts onto Xbox One in this enhanced Ultra Edition including an all new epic Dreadnought mode! Due to a sudden shortage of milk, cats around the world are forced to seek out new sources to get their fix. You and your team of milk mining kittens have overcome a fear of water to drill down under the ocean seabed and begin extracting vast reserves of what seems to be naturally forming full-fat milk. Get ready for fast paced submarine action, defending the kittens from disruptive mechanical sea creatures. The additional Dreadnought mode takes you deep down into the Meowiana trench. There you must fly through and destroy huge multi-screen enemy craft, whilst rescuing imprisoned kittens. Play co-op or solo, the milk must flow! 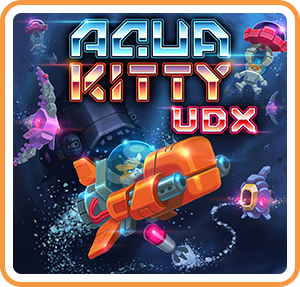 Where can I buy AQUA KITTY UDX physical/digital?